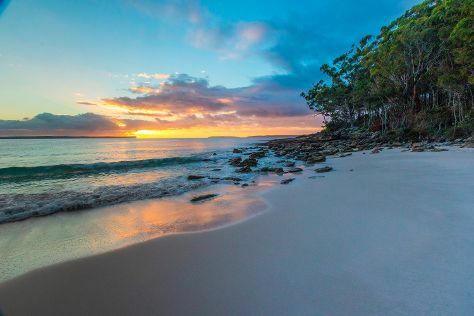 Mollymook is located on the South Coast of New South Wales, Australia approximately three hours' drive south of Sydney within the City of Shoalhaven local government area. Step out of the city life by going to Feeding Wild Rainbow Lorrikeets and White Sands Walk. Explore hidden gems such as Blenheim Beach and Murramarang National Park. Explore the numerous day-trip ideas around Mollymook: Jervis Bay (Cape St George Lighthouse & Collingwood Beach). It doesn't end there: explore the activities along The Bogey Hole and look for gifts at Rip Curl Ulladulla. For maps, more things to do, other places to visit, and tourist information, read our Mollymook attractions planning site . In April, daily temperatures in Mollymook can reach 26°C, while at night they dip to 14°C. Cap off your sightseeing on the 19th (Fri) early enough to travel back home.